Moneta Musings: The End is Neigh! At this point I have begun to add to my metals portfolio albeit at a slow pace. The correction we are experiencing has been pretty nasty to say the least. I am finding some encouraging things occurring at the moment. First, the sentiment toward the metals has turned pretty negative which is a positive in that warped stock market logic kind of way! Second, the correction especially in silver has been particularly violent and has shaken even many strong hands to the core, but the weak hands and riverboat gamblers have for the most part been purged thanks to the CME rate hikes. Many of you know that I disagree with the way the CME implemented the margin hikes but I do think the outcome will ultimately be a stronger upward movement in the metals market. This violent shakeout is exactly what the silver bull needed to move forward, no different than what Paul Volcker did for the US economy back in the early 1980's, clean out the excesses and deadwood. I have also found it encouraging that the metals have been down a couple days in a row and sometimes by quite a bit yet they bounce back. This up and down action is just what you want to see when an issue is building a base as eventually it will calm down but first it has to repair the damage inflicted upon it. Moreover, everywhere I turn these days whether it is TV, internet or stock message boards all I hear is how the commodity bubble and or the gold\silver bubble has burst and how things are going to continue to head down. This type of talk is music to my ears as I would know this was the "top" in things when everybody and their brother was recommending gold stocks or commodity stocks to me, but that is not the case today. In fact I was mentioning the idea of buying back in to some of the positions I had liquidated at higher levels and the reactions I got from acquaintances were as if I were nuts. In the mean time the dollar is having a little rally because A) the Euro zone is a mess(a shocker I know), B) the Dollar was short term oversold and is doing a technical bounce, and C) the sentiment was something on the order of 1% bullish toward the dollar. Interestingly on the last point I use a site called Forexpros.com to track the US Dollar with a live chart and they have a sentiment indicator on the site. The traders using the ForexPro site have had Dollar bulls running on the order of 65 -70% for the past few days, yet we are told in the media that there are 99% bears, interesting no? 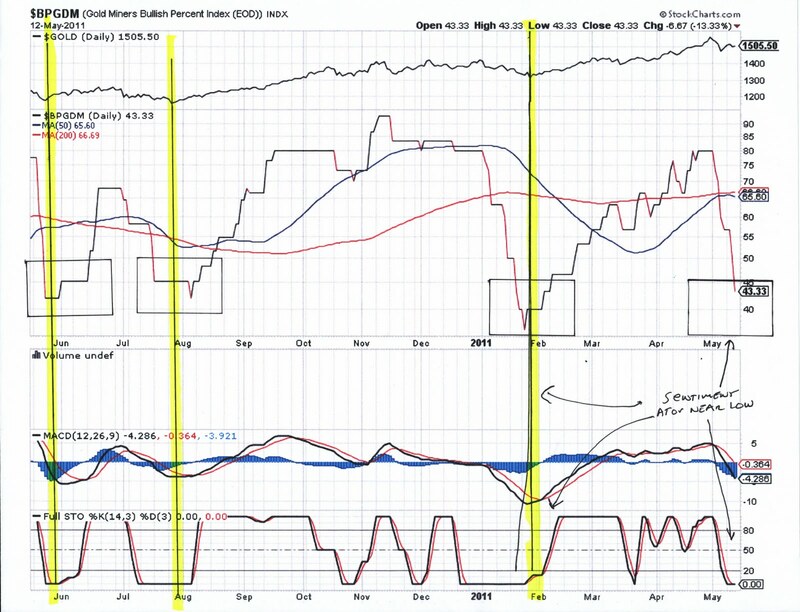 Well I have attached a couple charts below for you to peruse. There are 2 charts of the US Dollar one on a daily basis and the other on a weekly. I have drawn in the down trend-line which corresponds nicely to the 200day moving average. The Dollar has also moved to a pretty overbought condition and that in conjunction with both the down trend-line and the debt ceiling limit fiasco emerging should cap the dollar shortly, time will tell. 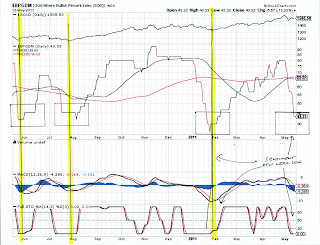 I have also attached a chart of the Gold Miners Bullish Percentage Index which has been a pretty good forecaster of bottoms and tops in the metals shares and at the moment we are getting into an area where bottoms are formed.The only time that the sentiment was more negative than on the chart I presented below was December 4th 2008 where we had a reading of 4. On December 5th we had a reading of 0 but I believe that is a data error on stockcharts.com. None the less we are definitely in the bottoming zone here which should coincide with the Dollar topping out. 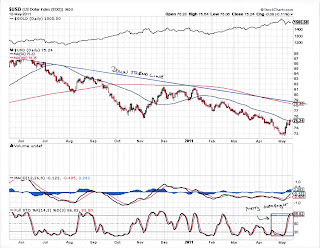 It appears to me that at 78.50 or so the Dollar should hit its brick wall if not sooner. 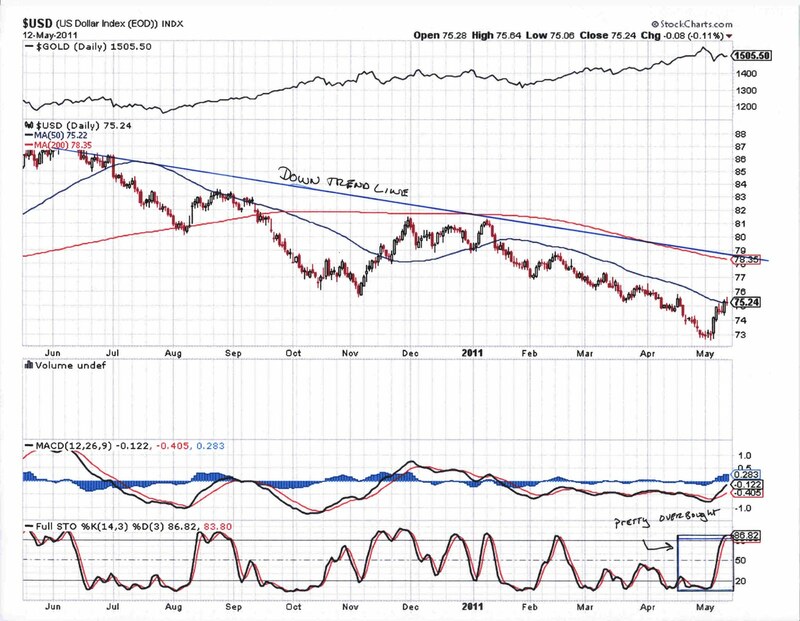 Additionally, even though the dollar is rallying does not necessarily mean that either precious metals or their stocks need to continue falling. The Metals and stocks could rise as the Dollar makes its top especially since it is just a technical bounce.